I think I’m on a weird kick because the last few books I’ve finished have reminded me a lot of different TV shows. First it was Tandem and Fringe and now it is The Naturals and Criminal Minds. Luckily, this comparison was a good one and I ended up really enjoying The Naturals. Cassie’s Mom was a ‘psychic’ who was murdered when Cassie was a kid. Following her mom’s death Cassie was sent to live with her paternal grandparents in lieu of her father who is in the military traveling. 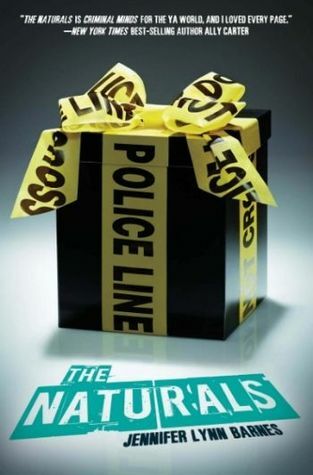 Cassie is a natural profiler and early in the novel she gets recruited to an FBI program called The Naturals. In the program there are 4 other teens each with their own unique talents and personalities. Lia is a natural lie detector and lie teller, Sloane is a numbers and statistics whiz, Michael who can read emotions, and Dean who is a profiler like Cassie. I enjoyed the give and take, between Cassie and each of these characters. I saw a lot of growth from Cassie as she gets to know each of them. The biggest qualm I had with this novel was the shoddily executed, ever cliché, love triangle between Cassie, Michael, and Dean. Michael is outgoing, and hits on Cassie right from the start. Then there is Dean who plays the brooding ‘I’m not interested because I have had a troubled past’ bad boy. There was enough going on in this novel that this clichéd loved triangle was rather unnecessary. My favorite thing was definitely the mystery surrounding Cassie’s mother and the string of serial murders that are occurring around the group. This portion of the story was very criminal-minds-esque, and it made the last half of the book fly by. I didn’t want to stop reading until I had figured out who the killer was and I wasn’t really sure who it might be right up until the end. I will say the crime solving was a bit rudimentary but this fact didn’t take away from the story or mystery. Overall, The Naturals was a quick and addictive read. It had that old timey dime store novel feel mixed with the TV show criminal minds. It was a combination that had me rapidly turning pages, and loving every second of it. Thank you Disney-Hyperion and Netgalley for providing an advanced reader’s copy of this novel for review. I was looking forward to this book but the love triangle is just something I can't tolerate no matter how well done. Sigh. Skipping this one, unfortunately. I really, really liked this book! I didn't mind the love triangle, but I'm interested to see where it goes in the second book. And gosh, that last half--I did NOT want to put the book down until I finished! I kept second guessing myself and was right then wrong and back and forth. Great review! So glad you enjoyed this one! I really like the writing style of Jennifer. So eager to get my hands on this book. It sounds like a great read! I love Criminal Minds! It would totally make a great premise for a book series, although I could do without the love triangle. Thanks for the recommendation! That love-triangle sounds disappointing. I'm kind of tired of love-triangles, but done well, they can be interesting. Criminal mind stuff sounds right up my alley, though. ;) I can't wait to read this one!